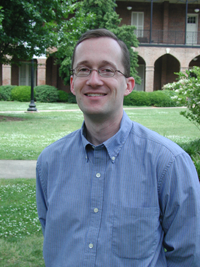 The Office of Undergraduate Research honors Forrest Phillips and Prof. Albert Pionke, both of the Department of English, as the undergraduate researcher and faculty mentor of the month. 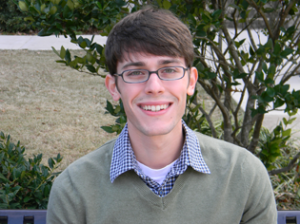 Forrest is a senior, majoring in English, and going to the UA law school after graduation. He participates in the English Honors Program that is directed by Professors Albert Pionke and Deborah Weiss. As a member of that program, Forrest wrote an honors thesis, entitled “Navigating the Frame” under the guidance of Prof. Pionke. Forrest’s short essay describing his thesis and his research and writing experience is attached. Please read it, but here are a few highlights on his undergraduate research experience. When I was offered a chance to undertake an extended research project, I jumped at the opportunity—even though, at the time, I didn’t have the slightest idea what my topic would be. However, that proved to be a very small problem to overcome, as I found that one of the most exciting aspects of undergraduate research is the relative freedom-of-subject it offers, and in consultation with my thesis director Dr. Albert Pionke, I was able to quickly decide upon a topic that was not only suitable for an extended research paper, but also tailored to my individual interests. In fact, I should probably admit to being just a bit selfish when it comes to my choice of topic, since it takes my academic interest for textual semiotics (a field which, to put it simply, is concerned with the logic behind how a text communicates its meaning, rather than merely what a text means) and combines it with what is undoubtedly my favorite hobby: watching movies. I’d advise that potential researchers take a similar approach: choose a topic which interests you not only within the academic setting, but outside of it as well—as doing so not only grants you a head-start in the form of prior knowledge, but it makes the research genuinely fun to do (it was impossible for me to tag film analysis with a label so dull as homework). Also, while it’s difficult to find a topic about which you can know everything, it’s fairly simple to choose one about which you’re certain that you’ll have fun learning more. As for a description concerning my own research, it’s a study of film-oriented semiotics as seen in three very different (though all equally self-aware) movies: Hollywood iconoclast Buster Keaton’s late silent era comedy The Cameraman (1928), British Filmmaker Michael Powell’s psychoanalytically inclined, contemporarily reviled Peeping Tom (1960), and Austrian director Michael Haneke’s narratively ambiguous, post-modern thriller Cachè (2005). These films act as self-reflexive guides in my thesis, highlighting how the cinema stabilizes (or, at times, destabilizes) viewerly rationalization of its contents. Apart from the significant dependence on traditional print-based sources, such a topic required that I spend a great deal of time watching and analyzing movies—which, for me, made for an extremely enjoyable form of research. In addition to enjoyable, I can think of a few other words to describe my undergraduate thesis experience: it was slightly intimidating at the beginning, frequently stressful during the in-writing process, and extremely rewarding upon completion. I also think that I’d call research a practical experience, since it allows an opportunity for undergraduates to develop traits and hone skills that prove essential to any profession: self-tasking, sustained effort, and effective problem-solving being chief among them. But I don’t want to make it seem like undergraduate research is experience that’s entirely defined by its isolation. On the contrary, writing a thesis gives you a chance to work closely with a research supervisor. And, if you don’t already have a close relationship with a prospective thesis director (I certainly didn’t at first), don’t worry—because you’ll doubtlessly develop one over the course of the research. As for myself, I greatly enjoyed writing a thesis with Dr. Pionke as my supervisor. He was, in my opinion, the ideal editor—rarely taking serious issue with my writing solely because of a difference of personal opinion (he may have interpreted a scene one way; myself another), but always ready to test the soundness of the logic that led to that contested opinion. Though the film aspect of the thesis might have required Dr. Pionke to do a bit of research himself (I’m grateful for his willingness to do so, by the way), his prior knowledge of literary semiotics was extensive, and helped strengthen both the actual content and the conceptual approach of my writing. Also, I found that my thesis meetings with Dr. Pionke gave me an opportunity to occasionally discuss the possibilities of life after graduation. At least in the big picture, this might even be considered a more significant concern than the research at hand, and I imagine that the researcher/supervisor relationship allows post-graduation options to be discussed with a frankness, comfort, and familiarity which would be difficult to find over at career services. While on the slightly ominous subject of life after graduation, I should mention that I’m starting law school at UA in the fall, and undergraduate research has been irreplaceable preparation for that next step. While law school and my undergraduate research might seem entirely different (as film analysis frequently looks at texts which are rooted in illusion, while the interpretation of legal documents can often have very immediate, tangible consequences), I’ve also found a few fundamental similarities. Of course, both demand an earnest commitment—for, whether you’re writing an undergraduate research paper or a law school admissions essay, a lack of effort leads to a poor final product. But I think that it’s the commitment to/respect for the argumentative process that serves as the most significant parallel between undergraduate research and law school preparation. When writing an undergraduate research paper, especially one on a topic as infinitely debatable as film, the logic that leads to your final conclusion is often just as significant as the conclusion itself. In the legal world, I think you could say that a similar emphasis on the argumentative process exists (after all, no legal ruling could ever be overturned if it were impossible to find a flaw in the logic that allowed for the initial decision). After talking about life after school, I’ll finish up by saying how I think undergraduate research improved my time at UA as an actual undergraduate. I’ve found that research at the undergraduate level is not only a continuation of the educational experience, but also an advancement of sorts. It allows you an opportunity to move past the classroom setting (where things like syllabi, test-schedules, and required readings provide structure, but also restriction) to a setting that offers more academic freedom. In fact, I think that undertaking a research thesis is a lot like creating a personalized class: you’re responsible for the class subject, the due-dates, and the preferred analytical approach—all of which, in the end, leads to a final product in the form of a completed thesis. Oh, and did I mention that I was actually able to research and write about movies? Forrest’s thesis, “Navigating the Frame,” concentrates primarily on three films — Buster Keaton’s “The Cameraman” (1928), Michael Powell’s “Peeping Tom” (1960), and Michael Haneke’s “Cachè” (2005) — to consider the self-conscious process of framing that implicates the viewer as co-creator of the absurd, traumatic, or criminal actions projected on screen. Building upon the work of an impressive range of previous critics, including Roland Barthes, David Bordwell, Umberto Eco, Susan Sontag, and Andrey Tarkovsky, the thesis explores how these representative films provocatively blur distinctions between watching and doing, intent and affect, rationality and indeterminacy, and in so doing require an interpretive effort on the part of the viewer that cannot avoid questions of ethics. Rhetorically elegant and supplemented by arresting frame captures from its chosen films, “Navigating the Frame” offered Forrest an extended opportunity to combine his research interests in textual interpretation, theories of the visual, and the history of cinema. Original and sophsticated, the thesis was also entertaining to read; as Forrest’s director, I suspect I learned as much or more from him as he did from me.